The Skye is an ancient breed, originally developed to hunt otters, foxes and badgers on the Islands of Skye and Colonsay. They were reportedly the ‘aristocrats’, belonging to the laird (lord of the manor) and not kept with the other hunting dogs. The breed reached its height of popularity after Queen Victoria acquired her first Skye in 1842. 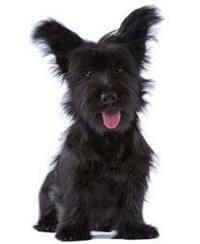 There are two varieties of Skye – the prick ear and drop ear, the prick ear being the most popular at the present time. The owner should be happy to have the dog in the house because Skyes need to be with their family. Skyes, especially males, can be dominant, therefore require a master who will ensure their dominance is kept in check. Puppies are fine with children if brought up with them, although children should be taught not to poke and pull at the puppy.